Playtime Season 3 continues with episode 5: Flashback – Part 1! Under pressure from Warren, Red reveals her past connection with Cobra. 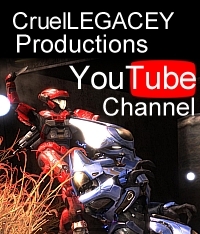 This entry was posted in Episodes, halo reach, Playtime and tagged cruellegacey, playtime, playtime season 3. Bookmark the permalink. This machinima is so good. I can’t wait to see the next episode , I really want to know why Red has fallen for Cobra.